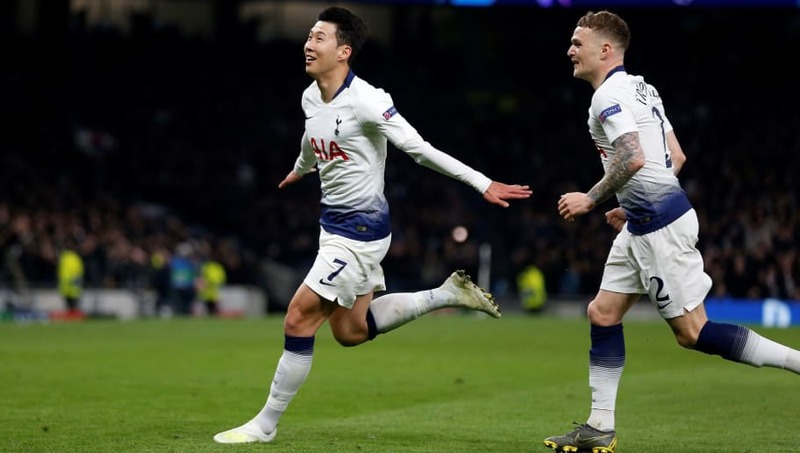 Manchester City's quest for the quadruple was handed a huge blow as Tottenham Hotspur picked up a vital 1-0 win in the first leg of their Champions League quarter-final on Tuesday. The drama did not take long to come to the surface as the Video Assistant Referee awarded City a controversial penalty early on following a handball from Danny Rose. However, Sergio Aguero's effort was saved by Hugo Lloris. The remainder of the first half was played at a frantic tempo, although clear-cut chances were certainly at a premium before the break. City dominated for huge periods of the second half, but simply could not find a way through Spurs' resolute defence. They were made to pay for their lack of creativity as, with around ten minutes remaining, it was Son Heung-min who opened the scoring, sending a powerful effort through Ederson and into the back of the net. The Citizens pushed for an equaliser but could not save the game, and they now face a serious fight to keep their European dreams alive. Check out our breakdown of the game. Often teams make the mistake of trying to dominate possession against Pep Guardiola's side, but Mauricio Pochettino opted for a different tactic. He encouraged the visitors to hold the ball, but demanded that his side pressed high, and it certainly worked. ...Spurs often recovered possession, brought it towards the left where Kane or Son would receive and switch play to a free Alli. Pochettino has gotten all of his tactics spot on tonight. Spurs are playing better than us. We still pose a threat though. So I'm calm. ​City's back line saw plenty of the ball, but ​Spurs made life hard for them by limiting the space in front of them. ​Son Heung-min and ​Del​e Alli showed great tactical awareness to time their presses, often forcing mistakes from the likes of ​Kyle Walker and Aymeric Laporte. Son's energy created the goal for Spurs, and they thoroughly deserved a reward for their endeavour. However, as ​Harry Kane was attempting something similar on ​Fabian Delph, he ended up picking up a potentially serious ankle injury. Spurs have struggled without their talisman in the past, and Pochettino needs to come up with a way to soften the blow. Starting XI: Lloris (7); Trippier (7), Alderweireld (6), Vertonghen (6), Rose (7); Winks (6), Eriksen (6), Sissoko (6), Alli (7); Son (8*), Kane (6). Substitutes: Lucas (6), Wanyama (6), Llorente (N/A). Pochettino wanted discipline from his forwards, and he got plenty of that with Son. The South Korean did everything he could to disrupt City's possession, bursting forward to give his side energy. Kane oddly looks like the weak link in Spurs attack. He is not as sharp as expected. Wish Son could get the chances he's had. He always looked to be the most likely source of goals for Spurs, and he did not disappoint, firing his side ahead deep into the second half. With Kane potentially facing an extended period on the sidelines, Spurs need Son to step up, and he looks ready to do so. Harry who? The quadruple isn't dead yet, but Spurs certainly put a nail in the coffin. For all the creativity in their squad, they struggled to create many good chances, and hardly looked like scoring at the Tottenham Hotspur Stadium. Grabbing an away goal would have been a fantastic achievement, but they simply did not come close. Guardiola failed to come up with an answer to Spurs' high press, and they punished him for that. This tie is by no means over. City could stroll out at the Etihad Stadium and hit Spurs for five or six. However, on this evidence, they will struggle to get one. City need to come up with a new game plan in time for Wednesday's second leg. Starting XI: ​Ederson (7*); Walker (6), Otamendi (6), Laporte (6), Delph (6); Fernandinho (6), Gundogan (7), David Silva (6); Mahrez (6), Sterling (7), Aguero (5). Substitutes: Jesus (6), Sane (N/A), De Bruyne (N/A). Ederson was awesome today, even if he probably should have stopped that goal from Son. Great command of his area, a few strong stops, at least one absolutely outstanding long ball over the top. He will be frustrated to have conceded but, outside of the goal, he enjoyed a strong showing. His passing and composure was regularly on show, and he was thoroughly unfortunate to come out on the losing end. Before the next leg on Wednesday, Spurs will host ​Huddersfield Town​ as they look to continue this impressive momentum. As for City, they will travel to ​Crystal Palace to try and keep their grip on the ​Premier League title, and they will certainly be desperate to get back to winning ways.